This weekend, I went to this amazing art warehouse/rooftop party with yoga, a DJ, live music, free drinks, food, the whole shebang. 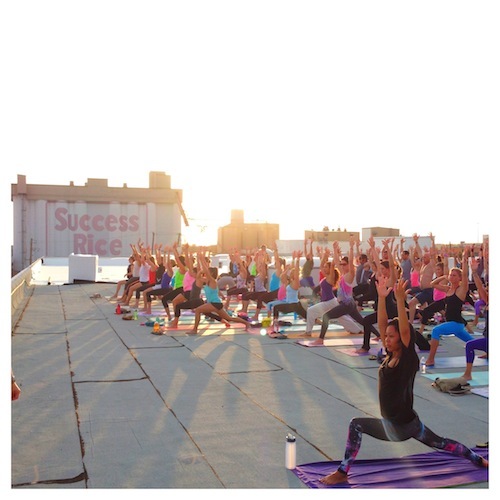 all to benefit a nonprofit that is working to bring yoga to all. We did the wobble (I successfully executed my on-crutches version of the wobble), drank Summer Shandy and hard apple cider, watched the sunset across the Houston skyline. Sometimes I think we do need reminders (I love it how straightforward Dooce’s post on this is) of how utterly beautiful the world is around us, in our own backyard. Even if there are no mountains or rivers or rolling hills. I laugh when people tell me that Houston is “ugly”- have you seen the sunset? have you see the skyline? have you felt the evening breeze, the only kind where it feels cool enough to feel refreshing yet warm enough to still be in a tank top and sandals? Even though I couldn’t do all of the poses, just sitting down in the midst of amazing people watching the evening sun set, I couldn’t help but feel gratitude, (and yes, this is my daily theme), gratitude for being alive, for being able to move around and wiggle my toes, for being able to reach my arms to the sky.